Claim the belongings of a Haafingar vampire hunter. Travel to Ironback Hideout and read Kragrash's Letter. Locate Kragrash's burnt corpse on a cliff edge south of the Thalmor Embassy and take his key. Return to Ironback Hideout and enter the cellar for your reward. This quest will be automatically added to your journal upon installing the Elite Crossbows Creation. It will direct you to Ironback Hideout, a remote bandit camp high in the mountains of Haafingar. This location can be quite difficult to reach as it only has one approach. Defeat the bandits camped out at the hideout and locate Kragrash's Letter on the mantel inside the ruined house. Searching the hideout, you may come across a new trapdoor beneath a tent. This trapdoor has been added by the Creation and is locked for now. The letter reveals that Ironback Hideout used to be occupied by an Orcish vampire hunter named Kragrash. He contracted vampirism and subsequently became suicidal, hiking east into the mountains to watch one final sunrise before he turned. In his letter, he invites you to seek him out and claim his vampire hunting equipment. You will need to travel to the nearby Thalmor Embassy to find Kragrash's final resting place. 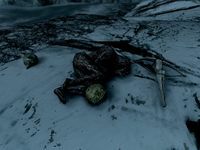 To the south of the embassy's entrance, you will come upon a burnt corpse on the edge of a cliff; this is the remains of Kragrash, who seemingly covered himself in Dwarven oil and allowed himself to be burnt up in the sunlight. Loot his corpse to find the Ironback Hideout Cellar Key which can be used on the trapdoor back at Ironback Hideout. With the key, you will have the ability to enter Ironback Hideout Cellar, a remarkably well-preserved base of operations containing a vault filled with vampire hunting equipment. The quest will end once you enter the cellar, but you are free to unlock the vault and loot everything within. 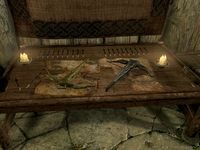 Laid out on a table you will find an Ebony Crossbow, an Elven Crossbow, and several Exploding Dwarven Bolts of Fire and Shock. These two powerful crossbows are the main reward for this quest, and can be enhanced using the nearby anvil.